No matter where you travel in Italy, art and history live on every corner. Explore one of the country’s biggest commodities in one of the most awe-inspiring city. After your arrival in Florence, a local driver will meet you at the train station/airport and transfer you to your centrally-located hotel. After check-in, get familiar with your surroundings and the beautiful city of Florence. 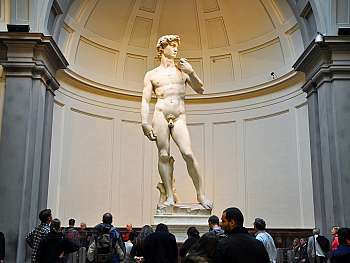 After breakfast, join your group and tour guide for a visit through the city center of Florence, including the Duomo complex, Giotto’s bell tower, a visit to the Accademia Gallery where you can admire, among other masterpieces, the “David” by Michelangelo. Spend the afternoon at your leisure, exploring the city at your own pace. Breakfast in hotel. Today enjoy Florence at your own pace. 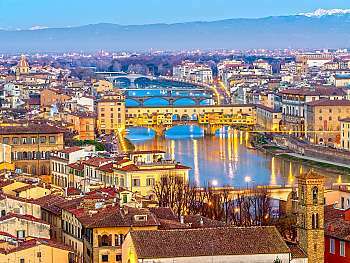 Optional tours are available or be your own guide, let Florence lead you through its small streets, have lunch overlooking the Arno river, walk over the Ponte Vecchio and shop on Via Tornabuoni. Local markets might be available. Ciao Florence! Prepare for departure after breakfast. Meet your driver for a private transfer to the train station/airport.